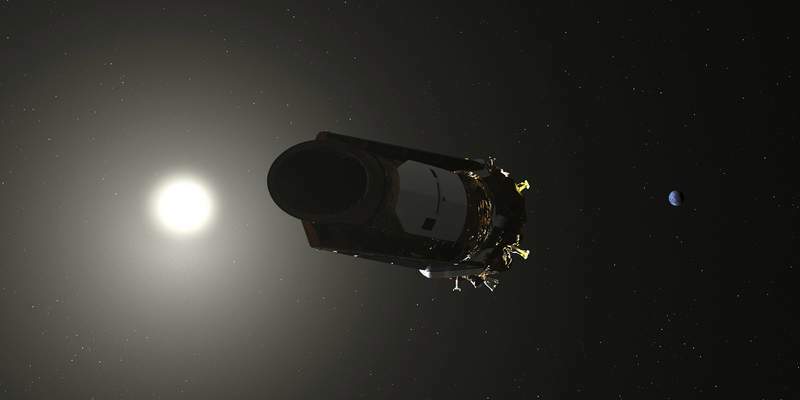 Associated Press This illustration made available by NASA shows the Kepler Space Telescope which has run out of fuel after traveling 91/2 years, discovering 2,681 planets outside our solar system. CAPE CANAVERAL, Fla. – NASA's elite planet-hunting spacecraft has been declared dead, just a few months shy of its 10th anniversary. Already well past its expected lifetime, the 91/2-year-old Kepler had been running low on fuel for months. Its ability to point at distant stars and identify possible alien worlds worsened dramatically at the beginning of October, but flight controllers still managed to retrieve its latest observations. The telescope has gone silent, its fuel tank empty. “Kepler opened the gate for mankind's exploration of the cosmos,” said retired NASA scientist William Borucki, who led the original Kepler science team. Kepler discovered 2,681 planets outside our solar system and even more potential candidates. It showed us rocky worlds the size of Earth that might harbor life. It also unveiled incredible super Earths: planets bigger than Earth but smaller than Neptune. NASA's astrophysics director Paul Hertz estimated that anywhere from two to a dozen of the planets discovered by Kepler are rocky and Earth-sized in the so-called Goldilocks zone. But Kepler's overall planet census showed that 20 percent to 50 percent of the stars visible in the night sky could have planets like ours in the habitable zone for life, he said.